Dramatic events continue to unfold in the nine-year effort to send Seattle's long-suffering elephants, Chai and Bamboo, to a sanctuary. On April 15, the Woodland Park Zoo (WPZ) whisked the elephants out of Seattle hours after a judge denied a temporary injunction to keep them in Seattle and hours after the City Attorney's Office finalized an ordinance that would have required that Bamboo and Chai were retired to the PAWS sanctuary. On April 17th, the zoo announced that the elephants were in San Diego, detoured due to "inclement weather" along the planned route to Oklahoma City Zoo. This move raises more questions than it answers. Many are questioning this apparent rushed and poorly-planned transport to allegedly subvert a city ordinance. Why did the WPZ elect to move the elephants during forecasted storms along the route - did they fail to check the weather reports or choose to ignore the ominous forecasts altogether? Did Bamboo suffer from colic en route and try to lay down in her crate? Why the urgent detour to a different zoo known for having a hospital facility for elephants while bypassing seven closer zoos? Why are city leaders failing to show progressive leadership and take action on behalf of the elephants? As Chai and Bamboo are "resting" at the San Diego Zoo after their transport to Oklahoma was interrupted, a bold move was made Monday by Seattle City Councilmember Kshama Sawant to give Chai and Bamboo another chance at sanctuary. 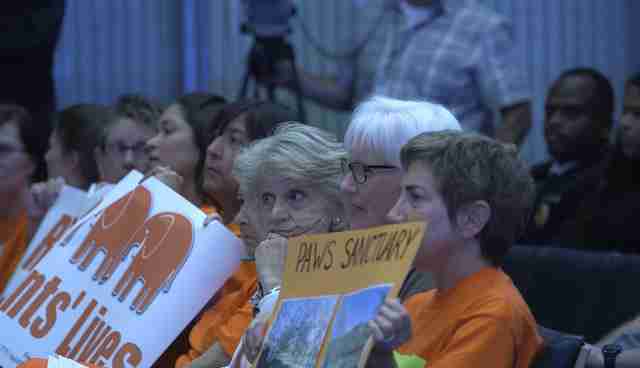 She introduced an ordinance that would have forced WPZ to send the aging Asian elephants to the PAWS sanctuary in California and not another zoo as planned. 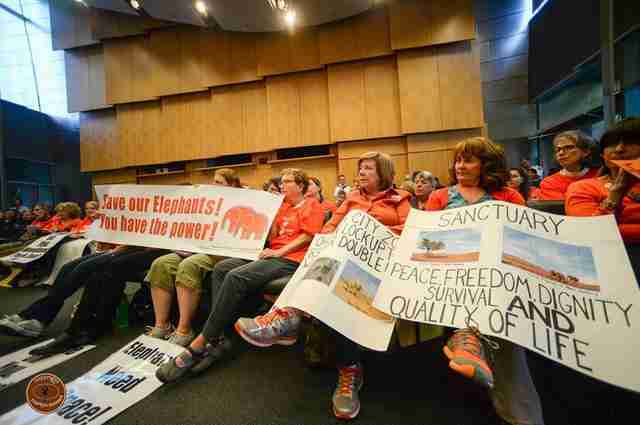 Members of advocacy group Friends of Woodland Park Zoo Elephants (FOWPZE), which has worked for nine years to have the elephants transferred to the PAWS sanctuary, packed the City Council chambers, wearing their trademark orange and holding signs in support of sanctuary. 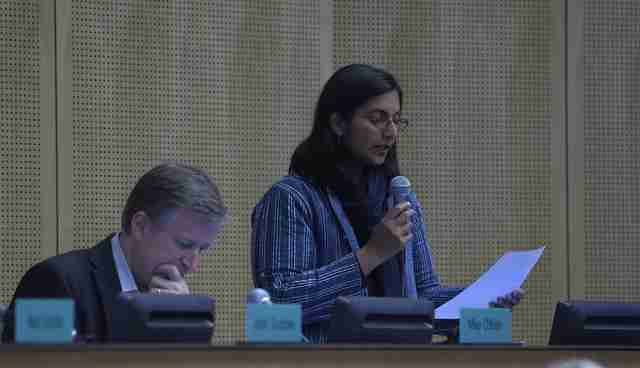 CM Sawant's motion failed as five city council members voted it down. 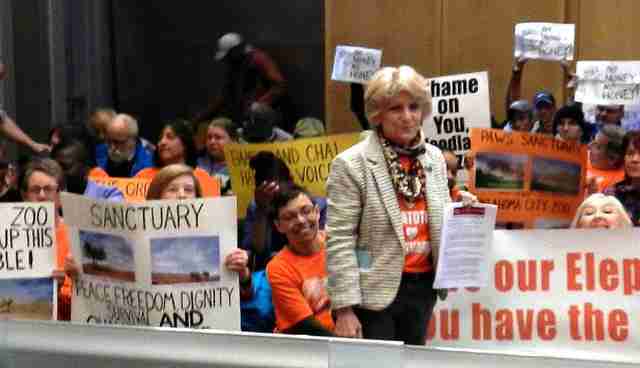 Two of the council members who voted against it, Sally Bagshaw and Bruce Harrell, had previously supported moving the elephants to a sanctuary. After her motion was rejected, CM Sawant expressed her frustration at the council's failure to act, despite the fact that 92 percent of Seattleites want Chai and Bamboo sent to a sanctuary, not another zoo. In a telephone interview Tuesday, Ted Virdone, Legislative Assistant to CM Sawant, said the activists had made a compelling case that sanctuary was the best choice and the ordinance was the legal strategy. He said more than 100,000 emails were received and hundreds of advocates regularly attended City Council meetings for Chai and Bamboo in support of sanctuary. "Who's going to represent them [the elephants]? The zoo board is not elected, so it was really kind of incumbent on the Council to represent them if they were going to be represented at all." "A vast majority of Seattle voters want Bamboo and Chai retired to PAWS sanctuary but our electeds are ignoring the values of their constituency. Woodland Park Zoo has been disingenuous in their reasons for selecting Oklahoma City Zoo and for rejecting PAWS. The Mayor and City Council must not capitulate - they must pass an ordinance for sanctuary - anything less diminishes our humanity." A rushed transfer of the female Asian elephants from Seattle's WPZ on April 15 to the Oklahoma City Zoo was diverted to the San Diego Zoo two days later, possibly due to Bamboo falling ill with colic during the journey. The WPZ claimed the diversion was due to a winter storm in the Colorado Rockies and Wyoming, and that Chai and Bamboo were taken to the San Diego Zoo to "rest" and stretch their legs before continuing their journey. The zoo claims the weather conditions were considered beforehand and were "favorable" for the 35 to 40 hour journey, but national weather forecasts show that the snowstorm was predicted Wednesday morning, hours before the elephants left Seattle. 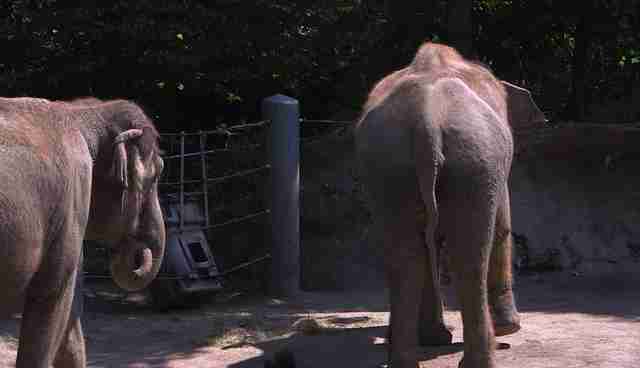 FOWPZE claims the actual reason for the elephants' diversion to the San Diego Zoo may have been due to a reported health crisis Bamboo was experiencing, and that the 48-year-old Asian elephant tried to lay down in her travel crate multiple times after developing colic. Though WPZ now denies that Bamboo suffered colic, the full story is still not known, and weather and health issues may have both been factors. 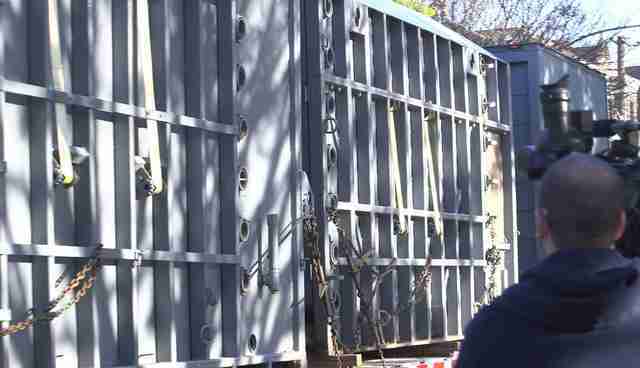 Following days of multiple requests by advocates requesting photographic documentation of Bamboo and Chai at the San Diego Zoo, on Monday the Woodland Park Zoo posted an update and short video of the elephants in their temporary holding facility. After the WPZ announced late last year that the zoo would close its elephant exhibit following the premature death of African elephant Watoto in August, activists redoubled their years-long efforts to send surviving elephants Chai and Bamboo to a sanctuary. Despite the fact that Seattle Mayor Ed Murray and a majority of City Council urged the zoo to consider retiring the elephants to a sanctuary, the zoo announced in February that it would send them to Oklahoma City Zoo (OCZ). 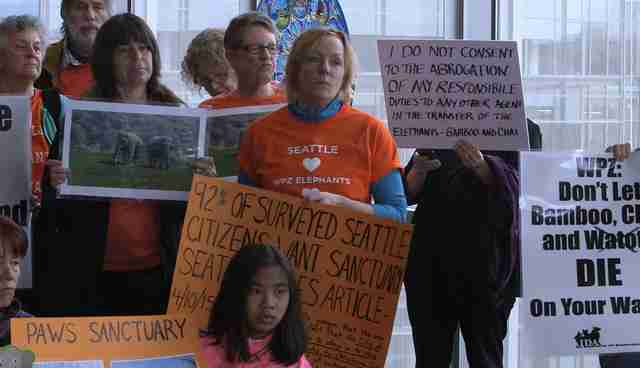 The Seattle Times newspaper steadfastly supported sanctuary in multiple editorials, and Friends of Lucy published an article in The Dodo on March 9, outlining the seven primary reasons why the OCZ was unsuitable for Chai and Bamboo. Prior to Chai and Bamboo's ill-fated, and many would argue botched, transfer last week, FOWPZE/Elephant Justice Project filed two lawsuits against the WPZ. 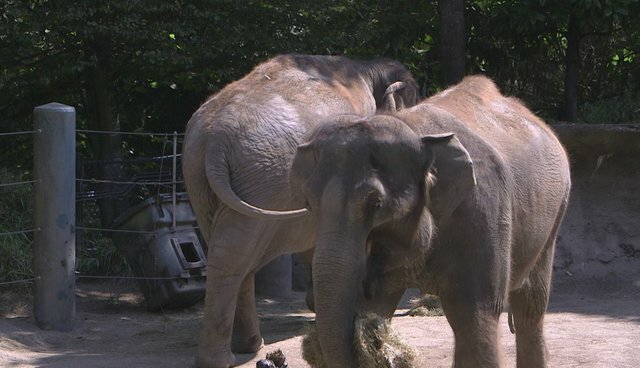 Both suits requested an injunction to keep the elephants in Seattle, the injunctions were denied; however the lawsuit in federal court can still go forward. On April 10th CM Sawant asked Seattle's City Attorney Pete Holmes to draft an ordinance requiring that Chai and Bamboo would be sent to PAWS and not to another zoo. The ordinance was completed April 15, the same day a federal judge ruled against FOWPZE's lawsuit asking for a temporary injunction to stop the zoo transfer. 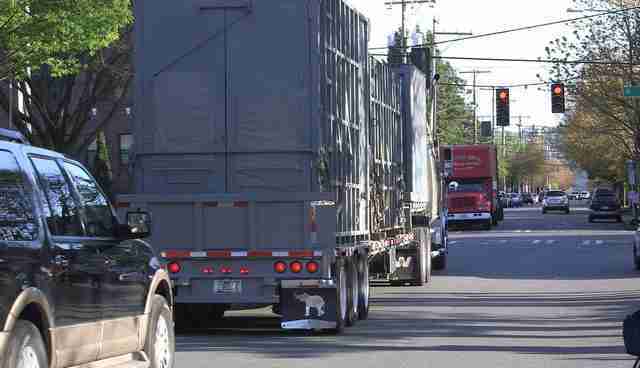 Within hours of the court's decision, the WPZ put Chai and Bamboo into their travel crates and the elephants departed Seattle for the Oklahoma City Zoo. 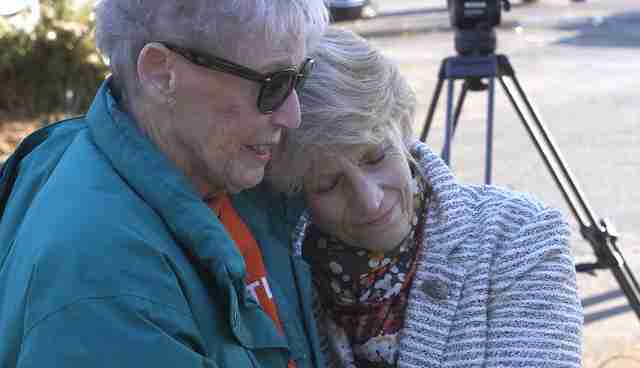 FOWPZE activists gathered at the WPZ to witness their departure, visibly upset. The Woodland Park Zoo states on their Facebook page that "The pair continues to rest in comfort" at the San Diego Zoo, and "Blood draws and other tests show no evidence of medical concerns." However, the WPZ has not directly responded to a statement by FOWPZE that "Bamboo suffered a bout of colic and attempted to lay down in the crate repeatedly about the time the transport team reached Salt Lake City." The WPZ states they still plan to move Bamboo and Chai to the Oklahoma City Zoo, however "a timeline has not been determined when they will get on the road again. For now we want to give our elephants time to rest comfortably." 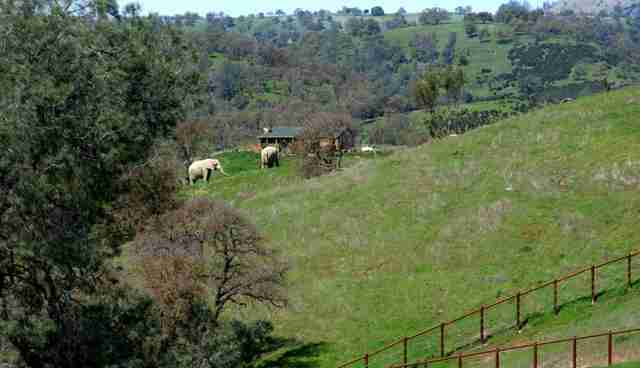 With the PAWS sanctuary only 470 miles north of San Diego, and Oklahoma City an arduous 1,300 miles away, advocates continue to call for the elephants to be transferred to that sanctuary. 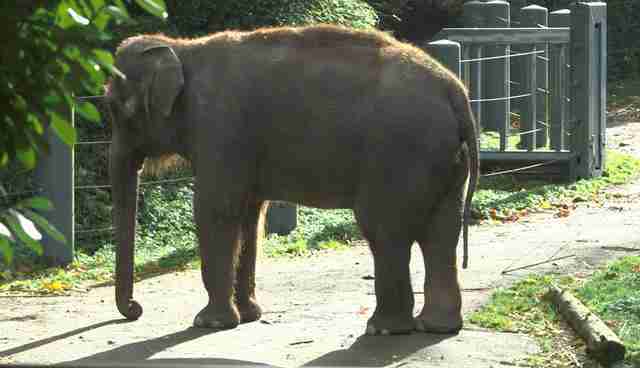 On Wednesday, FOWPZE announced a joint press conference with elephant transport experts Zoocheck, to be held at 11 am. Thursday, April 23 at Seattle's City Hall Main Lobby. Zoocheck's Campaigns Director Julie Woodyer and animal behaviorist Margaret Whittaker will address the bungled WPZ transport of Chai and Bamboo. These two women will be speaking to what they know: Ms. Woodyer planned the safe transport of the three Toronto Zoo elephants to PAWS in October 2013 by sourcing and recruiting an A-team of elephant movers led by Ms. Whittaker, who has successfully and safely executed a number of animal moves. Activists are encouraged to attend the press conference wearing orange, and to support calls for an investigation by the Mayor and City Council. Advocates can find all the email addresses, phone numbers and Twitter handles for Seattle's Mayor and city council at this link. But please note the Mayor's office is no longer using the email address listed on that link. Use this contact form instead for Mayor Ed Murray. Please do contact them and urge them to pass the ordinance for Chai and Bamboo to go to the PAWS sanctuary. Thanks!